Hey I have had my Aspen for about 3,300 miles now. When I first got it I noticed it was slow to warm up on cold days (<32F). The coolant temp gauge on the dash would stay pegged at the bottom then slowly rise to about 1/4 the way to the first big peg then stay there a minute then slowly rise up to halfway point just a hair (one small peg) below the big midway dash. I bought a brand new thermostat and had my mechanic friend replace it. He said the original one didn't look bad and he refilled the radiator with spec coolant. It still warmed up slow but seem to blow hotter air out of air ducts with the HVAC but it could be my imagination too lol. Now 3,000 miles later on a 21F night I watched it rise ever so slowly even though I was cruising at 65 mph and the engine about 1700 rpm. It seemed to move really slow tonight. Is this normal? If not what should I check next? Is it possible that I have an air pocket somewhere in the coolant passages? Sounds normal to me. I've always noticed this with the big V8's. They take longer to warm up. When the temps are low, mine may take a good 15-20 miles before it gets up to temp (same level as you are reporting). On the flip side, the V8's take longer to cool down as well so they maintain their warmth longer than a 4-banger would. Mine stays pretty low up here in the MN winter. I'll attach a pic from this morning. This is after about 10 mins driving and a temp of about 10 degrees F.
It still warmed up slow but seem to blow hotter air out of air ducts with the HVAC but it could be my imagination too lol. Now 3,000 miles later on a 21F night I watched it rise ever so slowly even though I was cruising at 65 mpg and the engine about 1700 rpm. It seemed to move really slow tonight. WOW cruising and getting 65 MPG! 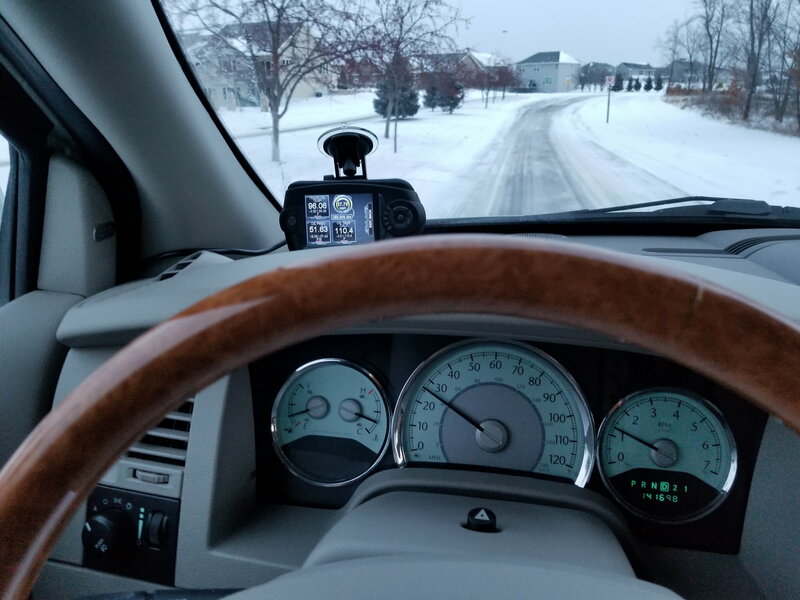 How long time wise and at what speeds is your running time with this big V8 A cold start out and short run even at 65 MPH at 1700 rpm will not heat the coolant up to give good heat into the cabin. You are running only slightly above idle rpm and have cold airflow going thru the radiator, try manually putting it into a lower gear to raise RPM's yet maintain your desired speed thru more throttle opening. That or investigate a slightly higher temp rated thermostat, that would keep warmer coolant circulating thru the heater core before opening and sending full flow thru the radiator. LOL @ 65mpg......I was like, what the hell is this guy talking about! Then I reread the post above. Good catch! Aspen couldn't get 65mpg on a 100 miles downhill with the engine off. Hey sorry about the mpg to mph confusion! Rawyzf is that a tuner/monitor on your windshield? Yep, that's my Diablo Trinity. I run the 91oct tune with MDS tuned out. I just Monitor trans and oil temp with oil pressure and have the mpg calibrated to the different tire size. Today it was 0F enroute to work and on the expressway it took the usual amount of time I described. On the way home from work it was 4F and the expressway was packed so taking it slowly through the side streets it took way longer. I literally froze the first 15 minutes because the engine was mainly idling in traffic with an occasional short burst of speed. I wonder if a flush with fresh coolant can improve this. I have had plenty of V8 suv's in the past but this it the slowest to warm but also my first Hemi. I put this a little faster than the diesels I owned which were notoriously for slow warming. I wonder if I have the tow package with larger radiator that might contribute to this slow warm up. If so I can accept it but I will get an app based remote start so I can start it 15 minutes before I get to it. Yeah, the low idle speeds are not going to help with warming things up. Even though I don't get temps that low down here, mine still takes at least 15 minutes to warm up to full temp when it is below 40 degrees. Now part of what helps me is that the first 5.5 miles (10 minutes) I drive are winding country roads and my transmission typically runs between 3rd and 4th for the majority of the way as I don't settle off at 55 or above to get in to 5th. So my RPM's are higher which helps warm it up, but kill fuel economy. After that, I'm on a good 6 mile straight with a speed limit of 60. By the time I hit the end of that, I'm usually up to temp. This is good because I then get on the highway running 70+. With temps as low as you are getting, I would recommend a remote start. Mine came with remote start but i rarely use it as I don't want to waste fuel. I really don't think a coolant flush would help. If the coolant was bad, it would be heating up faster or overheating. Not keeping it cool. Plus the block would be frozen. Of course, you could always test the coolant first. That's easy to do and the tester is less than 5 bucks. Also as the OP stated..replaced T-STAT and mech. refilled coolant. Have it tested for concentration(freeze point) as too strong of coolant to water mix will actually INHIBIT heat transfer..I learned that lesson a long time ago being in the Buffalo, NY area! I doubt that there are ready application specific T-STATS that are higher opening temp rated, but with some measuring and sizing you may find a higher rated one that will work. Yup, it would be a pain to change out again if your summer driving is that hot out, but even 5* higher will make an interior heat (lack of) better.